On Memorial Day weekend, 2015, the Bertil and Ulla Brunk Pavilion premiered in downtown Lake Geneva at Flat Iron Park, so named because of its triangular shape of an old flat iron used for ironing. Its dedication was on June 20 and its first performance was June 25. The Pavilion was named in honor of its primary benefactors, Bertil and Ulla Brunk, who kicked off the funding for it with $150,000. An additional funding of about $350,00 was raised through community fund raising, such as the signature bricks which were purchased at $100 each by families or individuals. These are now set in the "apron" around the Pavilion. 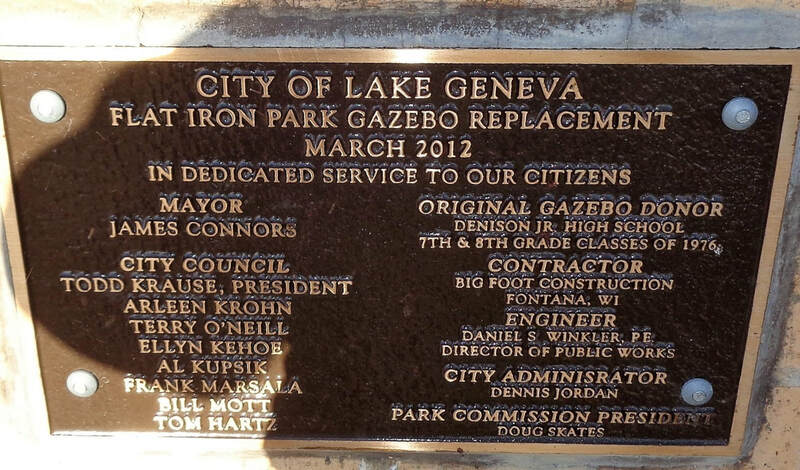 The impetus for the Pavilion was the Lake Geneva Beautification Committee formed in 2000 by the City. The committee has evolved into a nonprofit with more than 19 major projects to its credit, one being the Pavilion. Ken Etten of McCormack and Etten Architecture designed the eight-sided pavilion reminiscent of the Mediterranean style of Lake Geneva's Riviera Ballroom built in the 1930s. Etten collaborated with the Beautification Committee on the design which has terracotta color roof tiles, dark red and cream brick and almond painted trim. Atop is a cupola with stained glass windows, donated by a Lake Geneva artist, which shine 24 hours a day. The Pavilion's construction began in late March 2015 and was completed in late May 2015; it was built over land that was asphalt so did not take up any green space of the Park. The Brunk family has since provided funding for improved lighting. More landscaping is anticipated as of 2018. Many activities are held at Flat Iron Park. They include Lake Geneva Oktoberfest, Taste of Lake Geneva, Lake Geneva Concert in the Park, Art in the Park, Lake Geneva Venetian Festival, and Veteran's Memorial Day Ceremony. Just south of the Pavilion is the Flat Iron Gazebo Replacement, from March 2012, . "In Dedicated Service to Our Citizens". It is sometimes referred to as the "picnic' gazebo. Its Mediterranean style is in harmony with the Riviera and the Pavilion. It replaces wooden gazebo made by the Bader High School shop students and is. The Three Graces or Three Friends fountain is located at the southeast end of Flat Iron Park. The over 100 year old fountain was restored in 2008 by the Beautification Committee and the local Jaycees. In Greek mythology the Three Graces represent goddesses of such things as charm, beauty, and creativity. It can be enjoyed from any vantage point - it has no front or back. Also it is lit at night and water is caught in a basin at ground level - a perfect spot for pets to get a drink in warm weather. Bricks surrounding it pay tribute to pets that have have been loved and lost.